Brad Mehldau might be better known as the leader of the Brad Mehldau Trio, with bassist Larry Grenadier and drummers Jorge Rossy and Jeff Ballard (who succeeded Rossy in 2005). But then the pianist is not aversed to solo shows - for example, the Live In Tokyo solo album in 2004. Mehldau also has a knack for covering other artistes' songs, not necessarily jazz artistes. 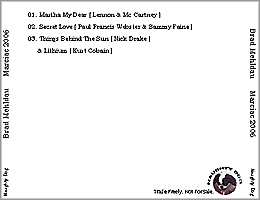 In this short radio broadcast, Mehldau covers Lennon and McCartney (Martha My Dear), the oldie Secret Love, Nick Drake's Things Behind The Sun and Kurt Cobain's Lithium. 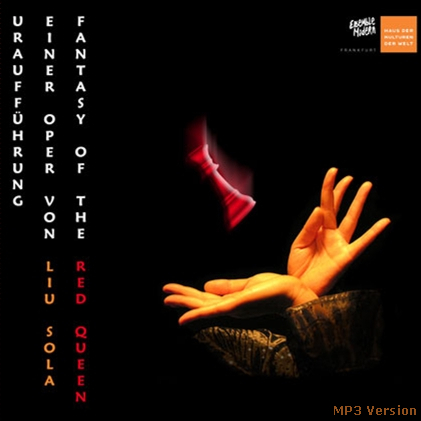 While Secret Love might recall Liz Story for a lazy Sunday afternoon, Mehldau's rendition of Lithium is quite spirited. Thanks to svpbit for sharing the lossless tracks on the internet. Note: There are minor FM interferances on Tracks 2 and 3. 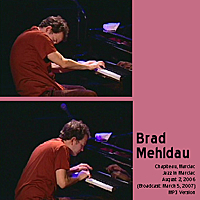 Click on the link to order Brad Mehldau albums.